Dhaka, 1 August, Abnews: Prime Minister Sheikh Hasina today expressed her firm conviction that Bangabandhu Satellite would play a pivotal role in overall development of the country, opening up new opportunities for the learners of new generation. “Through the satellite we would be able to know the whole world and our children would be able to learn about space and nuclear technology, marine science and other areas of science, culture and nature which would be useful for them as well as country’s development,” she said. The prime minister was addressing a function here today at Bangabandhu International Conference Centre (BICC) organized for celebrating successful launching of Bangabandhu Satellite-1 and inauguration of its ground stations at Gazipur and Betbunia. Zunaid Ahmed Palak attended the function as special guests with post, telecommunications and ICT minister Mustafa Jabbar in the chair. Secretary of the post, telecommunication ministry Shyam Sundar Sikder and Chairman of Bangladesh Communication Satellite Company Ltd. Dr Shajahan Mahmud also spoke on the occasion. The prime minister inaugurated the two ground stations for Bangabandhu Satellite-1 through video conferencing with the officials of the Gazipur and Rangamati districts and engineers of the stations. She also released commemorative stamps issued by the postal department on the occasion. The prime minister said taking office after 21 years of brutal killing of Bangabandhu, her government had taken initiatives to attain food autarky as the prime and foremost task. 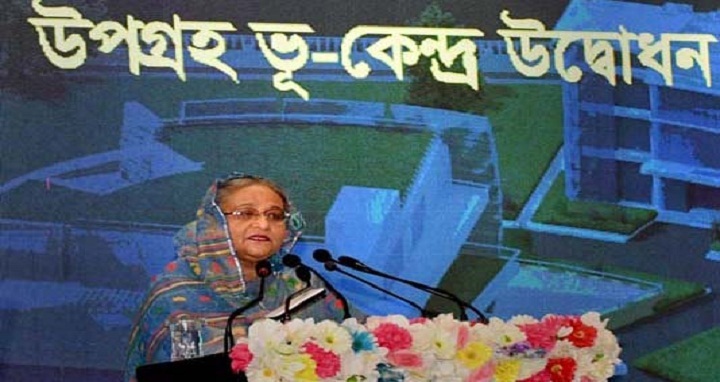 The Awami League government had also attached utmost importance to education on science and technology, she added. Awami league government after coming to office in 1996, has upgraded the analogue system of telecommunication to digital, she said, adding that television, radio and other modes of communication system were opened to private sector aimed at developing of the sectors as well as creating job opportunities. The prime minister congratulated the concerned engineers and officials who worked for successful launching of the Bangabandhu Satellite-1 in the space and inaugurating satellite ground stations at Gazipur and Betubunya.